First and foremost thank you for your support of our event to restore the Frederick Passageway. Due to inclement weather, we are postponing the event at Clutch to Monday, January 21st from 6:30-9:30 pm to ensure the safety and comfort of our guests. We hope that you will still be able to join us for live entertainment, open bar, and delicious food from our venue host Clutch Roadhouse on this new day and time. 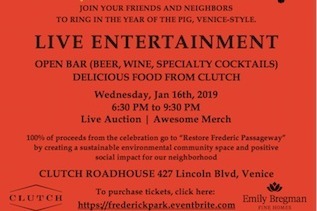 As a reminder 100% of the proceeds from this event, including ticket sales, will go towards supporting our mission of enriching our community and helping all who call Venice home — that being said, if you are unable to attend and wish to receive a full refund for your ticket you can directly e-mail us your request. Again, thank you for your support of our mission. When community comes together, great things happen. If you have lived here for any significant length of time, you will remember when the area connected Frederick St from Rose to Dewey was clean, empty and safe for running, walking, playing with your dogs and/or kids. But for at least three years now, that has not been the case. The police and sanitation department come out and clean up the area every once in a while, but within 24 hours, the area is back to its now-customary state - piled up with garbage, bicycles, filth and more than 30 people per night. We have been working with the local city council office for the past two years and have a permit to landscape this area so that a clean, attractive pedestrian Pathway will be created, and the empty space surrounding it will be filled in with native plants and landscape features. We have a plan. We have a licensed landscape company ready to implement the plan. We simply need to raise the funds to pay for it. If you live here, this will improve your quality of life. If you jog around Penmar Golf Course, we need your help! If you walk through this area on the way to church, shul, mosque, or school, this will make that walk better! In other words, we are all in this together. Some of us may have more resources than others but if we all commit to the common good, we can share the burden and create a better future for all. Please note that if we are unable to reach our $80,000 goal the money will be returned to each individual donor and the project will not move forward. WHO CAME UP WITH THIS PLAN AND WHO ARE YOU PEOPLE WHO ARE TRYING TO MAKE CHANGES IN MY NEIGHBORHOOD? The plan we are working from was commissioned by the former owner of 846 Warren Ave. She was trying to sell her home at a time when the homeless encampment was almost as bad as it is now. As a result she paid an landscape architect to design the plan we have now. It has been amended slightly as per the request of a couple neighbors living closest to the Pathway. This plan, in its current form, has ALREADY received a city permit to build. All we need to do is to reinstate that permit and construction can begin. The city councilman’s office tells us that it will take less than one day to reinstate the permit. With that in mind, we believe it would be extremely counterproductive to start at zero again and look for some other plan. So we’re going with what we’ve got! As for us, we are your neighbors! We live on Warren Ave. Some of us have been here more than 20 years, some of us have moved here within the past five years, and some of us are in between. We all love this block and our immediate community and we look forward to getting to know you as we work to improve our surroundings! SHOULDN’T WE HAVE A MEETING TO TALK ABOUT THIS? As mentioned, we would love to get to know you and everyone in the neighborhood! Yes, your input matters! Yes, your opinions matter! We would love to get together in small groups to discuss all of this. What we do NOT want is to have the type of meeting where people who don’t live in our neighborhood show up with their own agenda and shout down others who don’t share their point of view. We do NOT want to waste time with long and pointless debates about who caused the homeless crisis, and why so many of these folks come to Venice and not Marina del Rey. etc etc etc. We do NOT want to waste time criticizing the current city councilman or the city government. 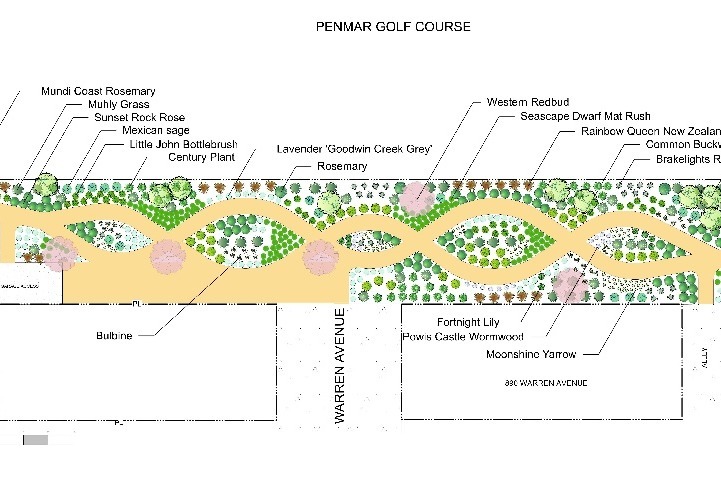 We DO want to improve the area at the western edge of Penmar Golf Course. Any meetings we hold will be towards achieving that immediate goal. IS THIS PART OF SOME ANTI-HOMELESS AGENDA? No! This is a grassroots effort that we neighbors started with the sole purpose of creating a clean, pedestrian-friendly environment at the end of our blocks. We are not involved in any larger political issue involving Venice, the City/County of LA and homeless activists. We all have compassion for the homeless. But we used to have a clean open space at the end of our block and we need to create one again. MY FRIEND/COUSIN/COLLEAGUE IS A LANDSCAPER. I BET HE COULD DO THIS JOB FOR CHEAPER. WHY DON’T I CALL HIM AND SEE? We appreciate the enthusiasm! That said, a project this size, on a public easement requires the contractor to be fully vetted, insured, and experienced with municipal-type projects. It has taken quite a long time to find this landscaper and we feel confident that he will do a good job. THE PLAN LOOKS NICE, BUT I THINK WE SHOULD ADD DIFFERENT PLANTS. AND, WHY DO YOU WANT TO USE DG INSTEAD OF CONCRETE? ALSO, WHAT ABOUT A VEGETABLE GARDEN? We must NOT allow the Perfect to become the enemy of the Good. In other words, there’s always going to be something that could be better. Ours is an imperfect world. But we can’t allow this to drag on and on, like it has done for years. We have to focus on priority #1 - to have a clean, safe, pedestrian-friendly area at the end of our quiet residential blocks. HOW DO I KNOW THAT MY MONEY WILL ACTUALLY BE USED FOR THIS PROJECT? That’s exactly why GoFundMe was created! To ensure a secure, effective way for crowds (that’s us!) to fund a larger project. The company has safeguards in place to guarantee that the money will ONLY be used for its intended purpose. Saul Janson, one of the organizers of this project and a fellow neighbor, will be soley responsible for withdrawing funds and making payments directly to landscaper. Thank you for your partnership and we look forward to crossing paths soon! Thank you so much reaching out. If you are not already on our email distro list and would like detailed updates please email us directly at venicevoices@gmail.com. We want to offer you full transparency but are cautious about what we share on the GoFundMe page as it is such a public space and don't want anyone or anything derailing our progress. That being said we can tell you that the organizers of this project have been working day and night meeting the unforseen demands of the city. Though it was said time and time again that it would only require a stamp and a smile to reinstate the permit it ended up being a bit more complicated than that. Fortunately we've met every challenge head on and have met every demand the city has asked of us. At this point we are confident that we are within striking distance of beginning work on our beautiful new park. We apologize for the delay. We are working as hard as possible to see that this comes to fruition as soon as possible. Again if you are a contributor and would like more detailed info please email us directly. Thank you again for your support and patience! We are so close! First and foremost thank you for your support of our event to restore the Frederick Passageway. Due to inclement weather, we are postponing the Clutch event to Monday, January 21st from 6:30-9:30 pm to ensure the safety and comfort of our guests. 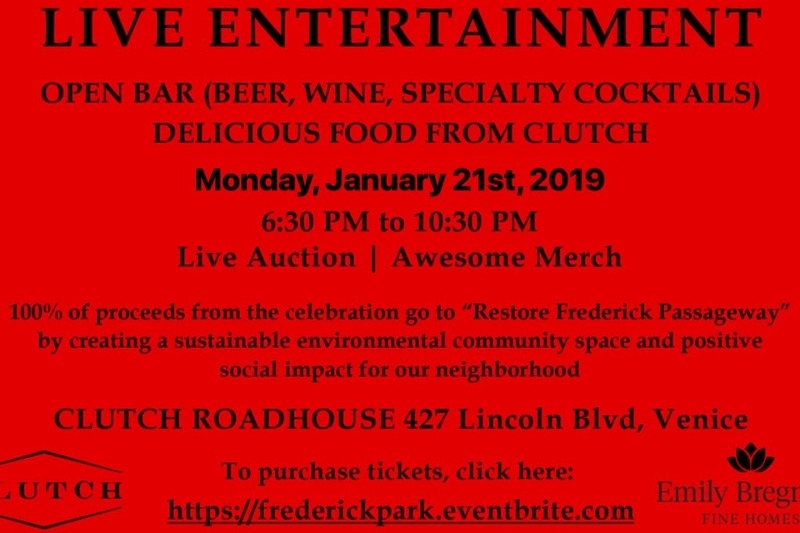 We hope that you will still be able to join us for live entertainment, open bar, and delicious food from our venue host Clutch Roadhouse on this new day and time. As a reminder 100% of the proceeds from this event, including ticket sales, will go towards supporting our mission of enriching our community and helping all who call Venice home — that being said, if you are unable to attend and wish to receive a full refund for your ticket you can directly e-mail us your request. Again, thank you for your support of our mission. When community comes together, great things happen. Well, we did it! We all decided to take a step forward and actively participate in creating a space that everyone will be able to truly enjoy. Every plant, every, tree, every stone will be significant because each will represent a neighbor who decided to get involved. Its truly inspiring to see what can be achieved with collaboration, hard work and a shared vision! We look forward to saying hello as we cross paths along the new dirt path! The organizers of this project are continuing to work with the city to button up the final details before the permit is officially reinstated. We believe this should happen within the week. After the permit gets reinstated the city will officially give notice to residents of the encampment and will give them 4-6 weeks to relocate and the opportunity for outreach services to offer them assistance. After this period we can officially begin the project! 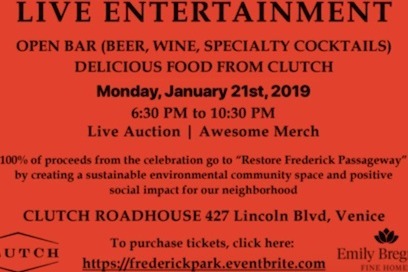 Let’s get together to celebrate our success over brews and food at Clutch Roadhouse on Wednesday January 16th at 6:30pm. All of the proceeds for this event will go toward maintenance and other supplementary items related to the Frederick Landscaping project! Can't wait to see you there!